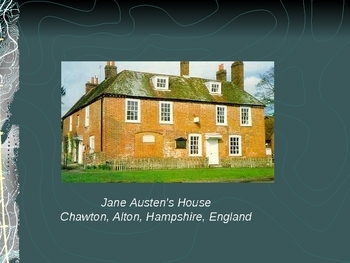 This Power Point Presentation has over sixty slides and is filled with information on the life and times of Jane Austen, as well as information on the novel Pride and Prejudice. 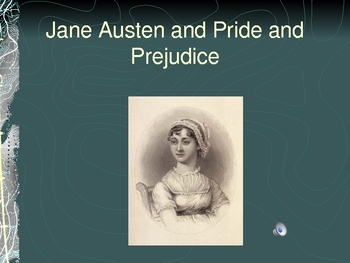 I use this to introduce the P&P Unit to upper level ninth grade students. 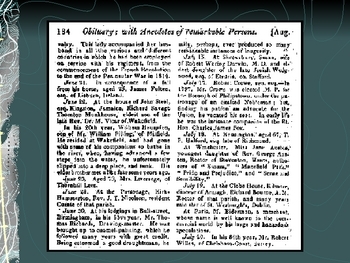 They take notes on the important unit terms, including satire, primogeniture, entailment, landed gentry, and more. 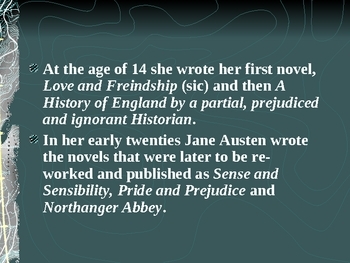 The show includes information about Jane's life, her other works, and the life of Regency England, including information on travel and visits, letter writing, and a Regency Quiz. The end of the show also includes images from some of the various film adaptations of the novel.